The president and provost crashed Thomasine Heitkamp’s Wednesday morning meeting to announce her selection as a Chester Fritz Distinguished Professor. This year, two professors were selected as Kent Lovelace of UND Aerospace will also receive the rare honor during Spring Commencement. Photo by Connor Murphy/UND Today. 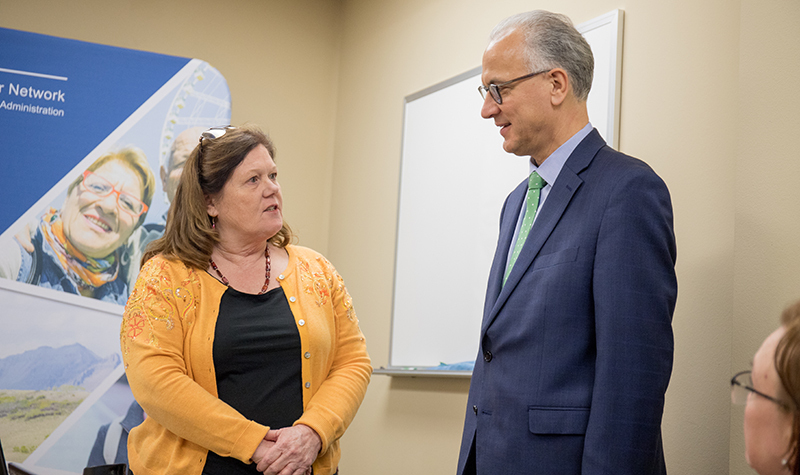 Thomasine Heitkamp and her team were in the middle of a teleconference, pursuing progress in their extensive grant work, when President Mark Kennedy and Provost Tom DiLorenzo walked through the door. Kent Lovelace arrived at the Dean’s Office in Odegard Hall, expecting a meeting about yet another exciting career pathway program for UND’s students. 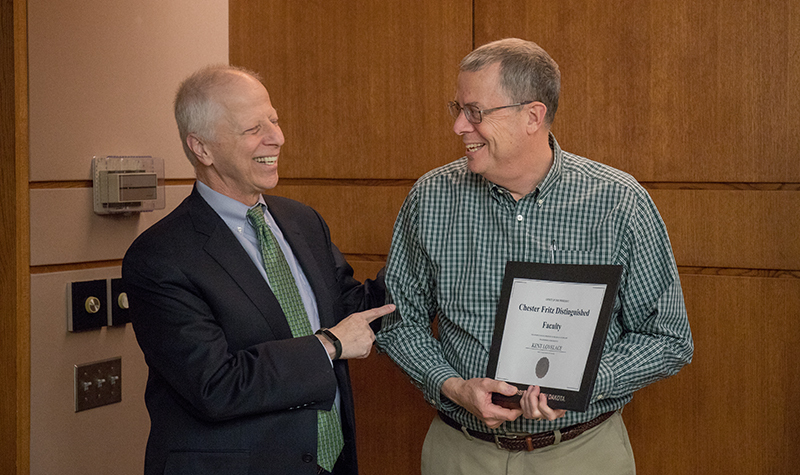 Both soon realized they were selected for the highest academic honor UND offers its faculty – the Chester Fritz Distinguished Professorship. In May, they will officially receive the distinction during Spring Commencement proceedings. Lovelace was speechless upon receiving the certificate, saying he was surprised to be selected. His colleagues were quick to say the recognition is more than deserved. Photo by Connor Murphy/UND Today. Lovelace was speechless and bowed his head, looking at the certificate, as members of his family entered the other side of the room. They all wanted to support a huge moment for someone who has dedicated his life to UND Aerospace. DiLorenzo went on to say that Lovelace is recognized as a face of aviation and aerospace, even beyond the University. Aviation Department Chair Jim Higgins was quick to quash that notion. 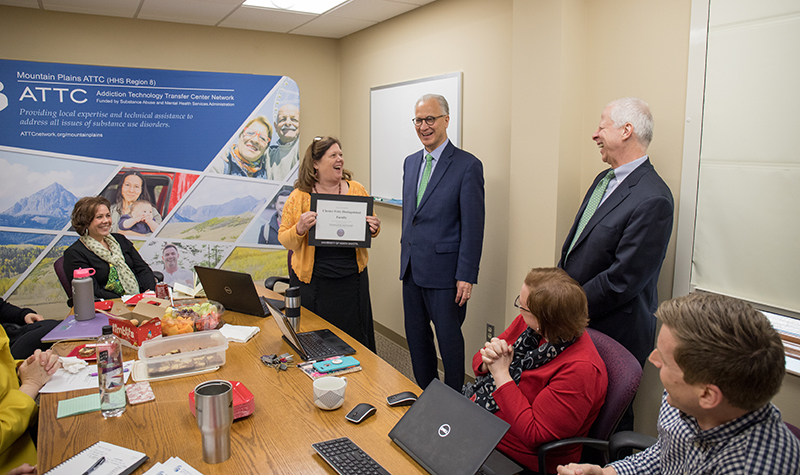 DiLorenzo said Heitkamp’s tireless research and collaboration, which was on display as they presented the award, made her a perfect recipient for the distinguished professorship. Photo by Connor Murphy/UND Today. Heitkamp found the intrusion on her meeting the perfect opportunity to introduce the University’s leaders to her Mountain Plains Addiction Technology Transfer Center/Opioid Response Network cohort at the University of Nevada, Reno. Under the grant, Heitkamp is program director for an effort spanning six states to expand addiction support, best practices and applied research in the wake of the opioid epidemic. “I’m delighted to change my title and pleased to be a Chester Fritz Distinguished faculty,” she remarked. “I want to thank the University for giving me so many opportunities that have been provided through a number of venues. The work we’re doing is very exciting. Diana Kostrzewski, dean of the College of Nursing & Professional Disciplines, remarked that the College was excited and happy to see Heitkamp’s leadership and scholarship recognized. DiLorenzo said, as with Lovelace, Heitkamp’s work goes above and beyond what qualifies them for the distinguished professorship. 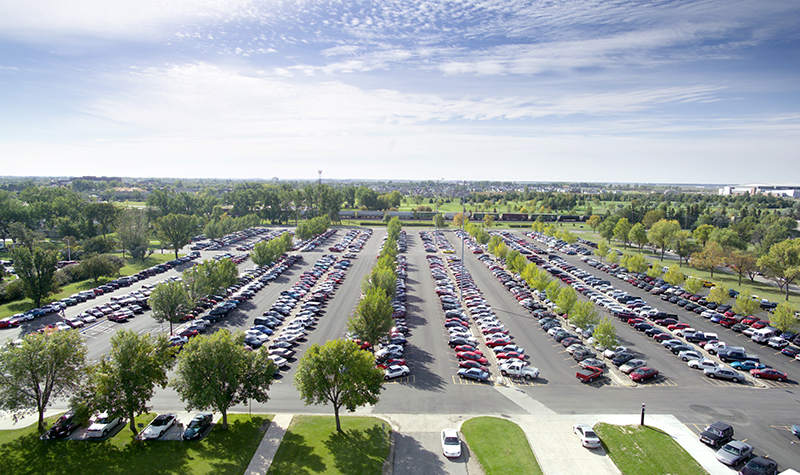 With nearly 40 years at the University and UND Aerospace, Lovelace oversaw many of the transformative years that established UND as the world’s preeminent flight school. (Above) Joining the president, provost and Lovelace is UND Aerospace Dean Paul Lindseth. Photo by Connor Murphy/UND Today. Heitkamp and Lovelace each have nearly 40 years of service at UND under their belts. 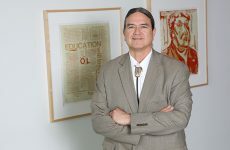 Earning his bachelor’s and master’s degrees at UND, in aviation administration and educational studies, respectively, Lovelace joined the Department of Aviation faculty in 1984. By 1994, Lovelace took on the role of department chair – a position he held until 2014 when the professor moved to be director of aviation industry relations. In that role, he’s negotiated and secured more than a dozen partnership agreements with airlines and aerospace industry leaders. Many of these take the form of pathway programs – allowing students to directly enter the industry and define their career paths as they attend and graduate from the world’s preeminent flight school. 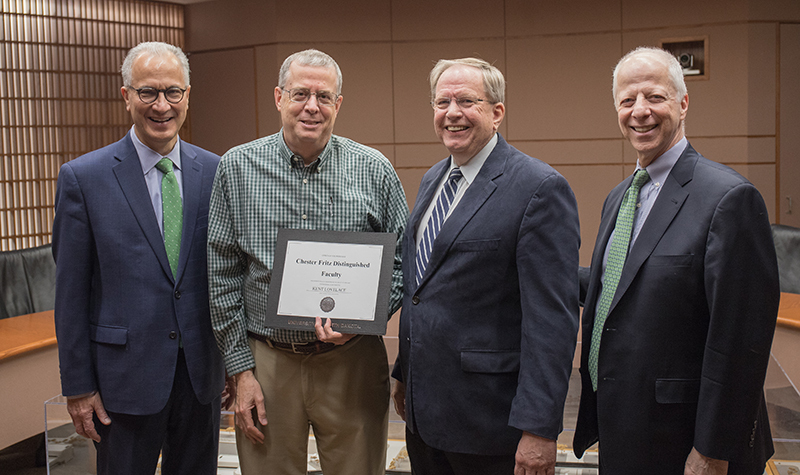 Another point of commendation is Lovelace’s leadership in pilot supply research. He and his research team are in consistent contact with the airline industry, as well as the Department of Defense, to present their up-to-date research on international pilot shortage issues. The University’s enrollment in aviation is hitting all-time highs. Heitkamp has brought millions of dollars to the University, in grant funding, through her research efforts to combat addiction and support mental health needs across the region. Photo by Connor Murphy/UND Today. Heitkamp receives her distinguished professorship after 36 years of teaching at the University, in the College of Nursing & Professional Disciplines. She attained full professorship in 2001, and has chaired the social work and graduate nursing departments. From 2013 to 2016, she served as associate provost. Millions of dollars in grant funding exist at UND through her efforts to combat addiction and support mental health needs across the upper Midwest, and beyond. Within the One UND Strategic Plan, Heitkamp is Grand Challenge Champion for Rural Health and Communities. 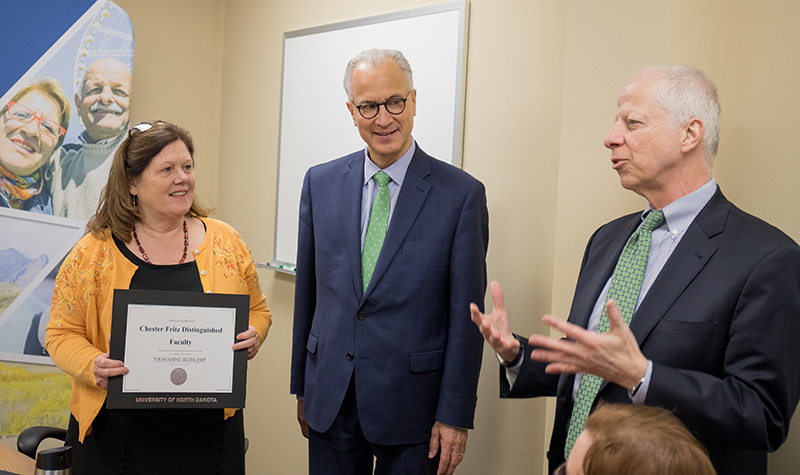 Through her research on substance abuse and its impacts, Heitkamp received the 2019 UND Foundation/Thomas J. Clifford Faculty Achievement Award for Excellence in Research, and the 2014 award for Outstanding Faculty Development and Service. Heitkamp maintains a focus on advancing “community engaged research” – applied research directly benefiting communities across North Dakota and changing public perceptions of what constitutes research, says Chester Fritz Distinguished Professor Emerita Sharon Wilsnack. Faculty selected for the honor are nominated through letters by their peers and deans, which are reviewed by a selection committee. The provost and president finalize recommendations made by the committee. In 2018, chemistry professor Alena Kubátová received the award.